Copyright law strikes a balance between private rights and public interests. Not everyone likes the balance the law sets. Copyright owners complain that it does not adequately protect them from infringement of their works. Critics contend that copyright law tilts too far in favor of the interests of copyright owners and does not safeguard the rights of consumers. Yet because copyright law is public law—enacted by Congress, enforced where appropriate by the President, and interpreted and applied by the courts—there is plenty of opportunity to monitor the effects of the law and to debate the ways in which it should be reformed. Increasingly, however, copyright law is being privatized. Its meaning and application are determined not by governmental actors but by private parties, and in particular by deep-pocketed copyright owners. Increasingly, the balance between private rights and public interests is set by private lawmaking. 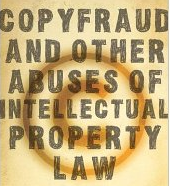 My new book, Copyfraud and Other Abuses of Intellectual Property Law, shows how copyright owners, unhappy with the scope of protections that Congress has given them, routinely grab more rights than they are entitled to under the law. They do this at the expense of consumers and of the public at large. One example is the widespread use of contractual provisions that enhance the rights of copyright owners. Many works, especially works delivered in digital form, are made available only to people who agree to give to the provider broader rights of ownership than copyright law itself actually confers. While copyright law permits reverse engineering of software to develop interoperable products, contractual terms imposed upon the customer prohibit all reverse engineering. Some contracts even require the customer to agree not to contest the content provider’s claim of copyright ownership, raising the possibility that works that are not even protected by copyright are subject to limitations that mirror those available for works that truly are copyrighted. Beyond altering the content of copyright law, private individuals and entities also play an increasing role in law enforcement. The MPAA supplies investigators to police departments to determine whether DVDs are pirated. Customs agents routinely defer to information supplied by copyright owners in seizing and destroying imported goods. VeriSign, the manager of .com Internet addresses has asked ICANN for permission to shut down domain names when asked to do so by law enforcement without the need for any sort of judicial review. Recently, White House officials, including Copyright Czar Victoria Espinel, were involved in negotiations between the recording and movie industries and ISPs to interrupt Internet access for users suspected of violating copyright law. These negotiations, which take the form of private agreements between content providers and ISPs, have vast implications for consumers. The traditional role of courts in determining whether infringement has occurred and punishment should be imposed is also increasingly privatized. Thousands of people targeted by the RIAA for file sharing have paid out penalties not because a court has found infringement but because it has seemed easier just to settle the dispute over the telephone with a credit card number. When this happens, the strength of the copyright owner’s case is never tested. The Stop Online Piracy Act (SOPA), the companion bill to the Senate’s PROTECT IP Act, would further privatize adjudication and punishment. Title I of that law (dubbed the E-PARASITE Act) creates a “market-based system to protect U.S. customers and prevent U.S. funding of sites dedicated to theft of U.S. property.” It achieves this by empowering copyright owners who have a “good faith belief” that they are being “harmed by the activities” of a website to send a notice to the site’s payment providers (e.g. PayPal) and Internet advertisers to end business with the allegedly offending site. The payment providers and advertisers that receive the notice must stop transactions with the site. No judicial review is required for the notice to be sent and for the payments and advertising curtailed—only the good faith representation of the copyright owner. Damages are also not available to the site owner unless a claimant “knowingly materially” misrepresented that the law covers the targeted site, a difficult legal test to meet. The owner of the site can issue a counter-notice to restore payment processing and advertising but services need not comply with the counter-notice. There is also a catch: a site owner who issues a counter-notice automatically consents to being sued in U.S. courts (a strong disincentive for sites based abroad). With few checks at all, SOPA gives copyright owners a sharp tool to disrupt and shut down websites. Based on their past conduct, there is no reason to think that copyright owners will use this tool with any measure of restraint. Copyright law that is made by private parties evades constitutional constraints that apply to actions undertaken by the government. For example, the Supreme Court has suggested that protections for fair use of copyrighted works may be constitutionally required; if Congress were to suddenly abolish fair use by statute, the change would be immediately challenged as violating the First Amendment. Fair use extinguished through private contract, however, is not easily subjected to constitutional scrutiny. Likewise, when government agencies conduct investigations, Fourth Amendment limitations on searches and seizures and warrant requirements apply. MPAA–run investigations, by contrast, proceed free from these constitutional restrictions. So, too, before courts may impose fines for infringement or order websites shut down, there must be notice, a hearing, and other procedural requirements that comport with due process. Private adjudication and punishment proceed without any of these protections. The biggest misperception about SOPA is that it is somehow unprecedented or extraordinary. It is not. SOPA represents just the latest example of copyright law defined and controlled not by the government but by private entities. Copyright owners will deploy SOPA in the same way they have behaved in the past: to extend out their rights. They will disrupt sites that do not infringe a copyright, interfere with fair uses of copyrighted works, and take other steps that evade the limits that the Copyright Act sets on a copyright owner’s actual rights. Much of what will happen under SOPA will occur out of the public eye and without the possibility of holding anyone accountable. For when copyright law is made and enforced privately, it is hard for the public to know the shape that the law takes and harder still to complain about its operation. Jason Mazzone is a law professor at Brooklyn Law School and the author of the new book, Copyfraud and Other Abuses of Intellectual Property Law (Stanford University Press, 2011). The website for the book is www.copyfraud.com.